With Valentines just two days away, I am sad to say that the Valentines Day crafts have just about come to an end. The good news is that Charlotte, P, and I are onto some new holiday stuff – St. Patrick’s Day and Mardi Gras! I wanted to kick off the new holiday celebration with something super easy today. 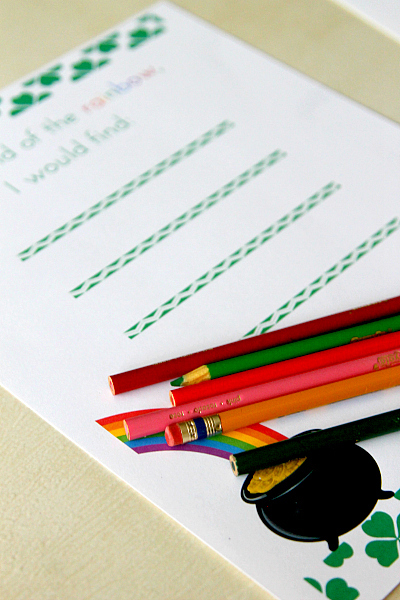 I created this St. Patrick’s Day “Under the Rainbow” set that can be used for about any age. If your little one is too young to write (like one of mine is), you can encourage he or she by asking the questions and filling out the paperwork. Then move onto the drawing portion! Make this St. Patrick’s Day Rainbow Snack Cup to snack on while you fill it out! I learned that she has a ‘house with an indoor pool’ under her rainbow. Me too, Charlotte…me too. 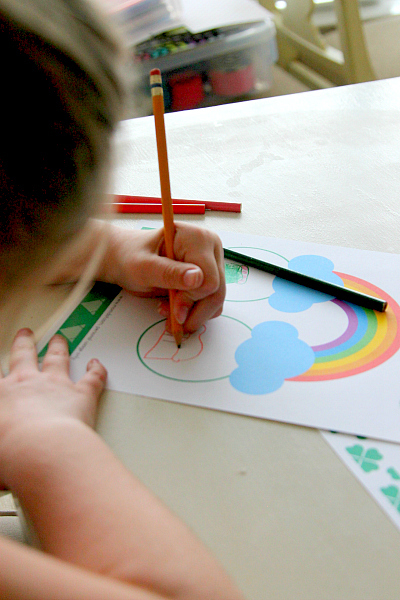 Here is the link to download my 2 free St Patricks Day Printables, which you can use in your house or in your classroom! Bloggers, I adore when you share! You may link to this post but please do not hotlink my printable directly. Ready for more St. Patricks Day Ideas? « Fortune Cookie Printable: Free Valentines Day Fortunes! Very cute idea – I pinned it. This is a great keeper project! These are so much fun! What a great page to save and look at the changes in answers each year. That’s a fun activity. I’m stingy though and won’t waste printer ink. Thanks for these! 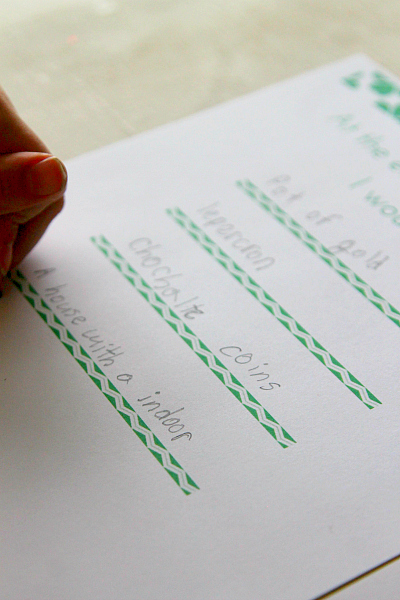 I love free printables and thees are perfect for St. Patrick’s Day. 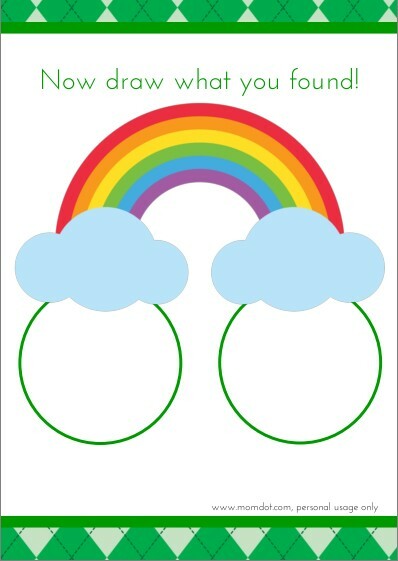 i like this idea as a conversation starter for kids or a way to explain what leprechauns are. St. Patrick’s Day crafts are so few and far between . . . and this is a really cute one! Once I get the new printer hooked up I think I’m going to print out a few and see what Gaby’s answers are! This is such a great idea! 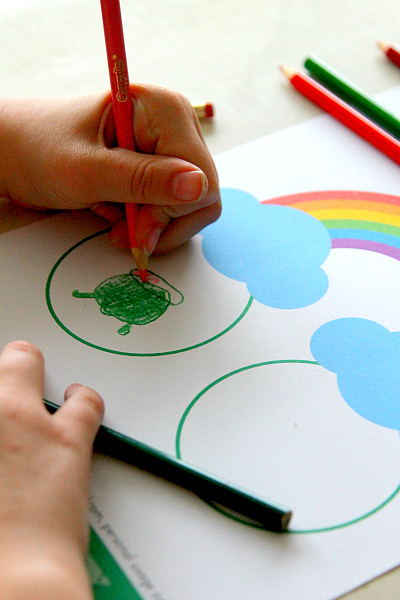 My fave is St. Patty’s day, but I always end up forgetting activities and crafts for the kids. Thanks for sharing this! Really cute idea for kids and exactly the kind of thing I would have done with mine. I love this! I can’t believe that it’s almost March! The printables are so cute. Exactly what I would have loved for my kids when they were younger. Wait, it’s not even Valentine’s Day yet!!! I can’t keep up with this holiday craziness. Though I must admit this is a really cute idea for a craft. 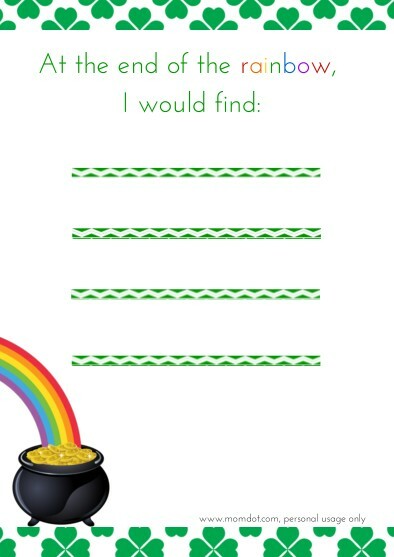 You just need a bowl of Lucky Charms to complete the picture! I LOVE this idea! Ethan can’t write well either, but I think I’ll either have Emma write his answers or let him draw his answers.